perfect for both of my kids. Details: Kids will sail 13' Hobie Wave catamarans. The boats are super fun, stable, and great learning platforms. Kids will learn to sail and explore the Bay in groups of three - five aboard each boat with an Instructor. Instructors are US Sailing Level One certified. Children will take turns doing each job on the boat, so that they will each experience and hopefully learn the skills of steering the boat, as well as, trimming the sails. All marine education lessons are hands-on. Campers will investigate life in Narragansett Bay through in-depth explorations. Children will investigate the three main marine environments - a sandy beach, a rocky shore and a salt marsh, all present at Fort Getty. Campers will discover what types of crabs, fish, invertebrates, birds and other animals live along our coastline. A typical day will include cool marine &/or environmental science lessons followed by first-hand explorations of various marine habitats. There will also be games, activities, arts & crafts throughout the day. 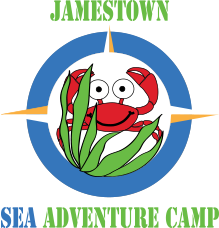 Children can join Jamestown Sea Adventure Camps for one week or more. Curriculums are adjusted weekly, so that each week of camp caters to the interests of the group. You will receive an e-mail confirmation of your registration confirming the week(s) of camp you selected immediately after registering. If you do not, please contact Meg Myles at CISFSailing@gmail.com.